TEnthalpy of formations for products and reactants (found in Appendix C) can be used via Hess’s law to calculate ∆Hrxn. These are tabulated at standard conditions (T = 25 °C and P = 1 atm). What is Hess’s Law and what do we use it for? Germain Henri Hess (1802 – 1850) is important primarily for his thermochemical studies. The law states that the total enthalpy change during the complete course of a reaction is the same whether the reaction is made in one step or in several steps. Hess’s law is understood as an expression of the principle of the conservation of energy, the first law of thermodynamics. Hess’s law allows the enthalpy change (ΔH) for a reaction to be calculated even when it cannot be measured directly. This is accomplished by performing basic algebraic operations based on the chemical equation of reactions using previously determined values for the enthalpies of formation. Addition of chemical equations leads to a net or overall equation. If enthalpy change is known for each equation, the result will be the enthalpy change for the net equation. If the net enthalpy change is negative (ΔHnet < 0), the reaction is exothermic and is more likely to be spontaneous; positive ΔH values correspond to endothermic reactions.Entropy also plays an important role in determining spontaneity, as some reactions with a positive enthalpy change are nevertheless spontaneous. where the o superscript indicates standard state values. 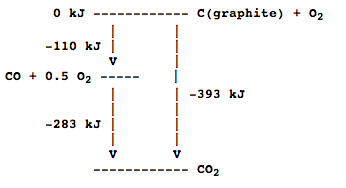 For example, in the diagram below, we look at the oxidation of carbon into CO and CO2. The direct oxidation of carbon (graphite) into CO2 yields an enthalpy of -393 kJ/mol. When carbon is oxidized into CO and then CO is oxidized to CO2, the enthalpies are -110 and -283 kJ/mol respectively. The sum of enthalpy in the two steps is exactly -393 kJ/mol, same as the one-step reaction. More importantly, we need to evaluate the enthalpy of CO.
C + O2-> CO2, dH° = -393 kJ/molCO +1/2O2-> CO2, dH° = -283 kJ/mol. The equation shows the standard enthalpy of formation of CO to be -110 kJ/mol. Application of Hess’s law enables us to calculate dH, dH°, and dHf for chemical reactions that impossible to measure, providing that we have all the data of related reactions.